Arsene Wenger shields his eyes from Pat Rice's shorts. Seven matches down, and this isn't going very well, is it? After the last international break, flush with new signings from the transfer window deadline, Arsenal scraped their way to a 1-0 win against newly promoted Swansea. Then, they imploded and lost at Blackburn. Then, a rebound, with a solid 3-0 win over Bolton. Then, they couldn't control the midfield and lost in the North London derby. 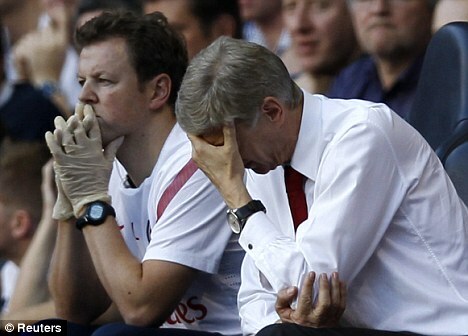 Every win has been a false start this season and this Arsenal team can't get the ball rolling. There's nothing tangible enough to build confidence again. After the loss at Tottenham, Alex Song said "The next five games are very important for us. We need to win every single [match] to come back and show the fans we are ready to fight for the league." Good in theory, but whoa whoa whoa, slow down Alex. Yes, we would all like Arsenal to pick up all 15 points available in those five matches. Yes, the fixture list is fairly favorable, save the trip to Stamford Bridge and the tricky match-up that Stoke provides. But, this is a team that has not won back-to-back league fixtures since February. A team that beat itself with two own goals against a last place side just a month ago. A team that has picked up 19 points from its last 18 league matches. Can this team just suddenly turn it on and win five straight? Possibly, but that's way too much to think about right now. Winning the next five games is a nice idea, but it cannot be implemented that way in practice. Arsenal can't pick up 15 points on Sunday, they can only pick up three, so that's where they need to start. One match at a time. Maybe even one half at a time, or even smaller intervals than that. Focus on the simple, more manageable things. Better passing, for instance. I can't count how many misplaced passes there were against Spurs. Thankfully, there are Premier League statisticians that do that for a living (or technology, or something, I don't know) and it was 119. Pressure the opposition better when they have the ball. SHOOT THE BALL MORE! Simple things can turn the tide. Start strong, finish stronger! Other clichés! Blah blah blah! how he'll get it. Photo: Daily Mail. There's a good amount of positive news on the injury front intermixed with the negative news of Bacary Sagna's long term injury. While a gaping hole might have opened up on the right side of Arsenal's defense, other gaping holes in the side have been closed by thanks to the return of other players. In the center of the back line, Laurent Koscielny, Johan Djourou, and Sebastien Squillaci have returned to fitness and all are available for selection tomorrow. In addition, Thomas Vermaelen is training again (!) but is still two to three weeks away from returning to the side. Let us all hope and pray that he faces no further set backs; it truly sounds like Arsenal is being overly cautious with his return, as to not aggravate the injury further. Aside from those who have had surgery, essentially everyone is available. We know Jack Wilshere's out until the new year. Abou Diaby is back in training and he's about 10 days away from a return himself (thank God?) The team from midfield forward essentially picks itself. The only question is who fills Bacary Sagna's shoes at right back. There are a lot of potential options, of players who could shift over from other positions, like Djourou or Koscielny. Talk of Francis Coquelin playing there has been squashed (he has played the position before, as in the FA Cup loss at Stoke two years ago, but it's not comfortable for him.) All signs point to Carl Jenkinson to get the start. And while he may be inexperienced, you can't fault him for that or complain when he starts. How do you expect him to get top level experience without playing? You certainly can't question his work ethic. A string of solid starts under his belt and the doubters might all be singing a different tune. Predicted XI: Szczesny, Jenkinson, Mertesacker, Koscielny, Gibbs, Song, Ramsey, Arteta, Gervinho, Walcott, van Persie. weird here. Photo: Sky Sports. Nicklas Bendtner's unavailability due to loan terms and Premier League rules leads to a bit of a selection and formation problem for Sunderland, who have been playing a 4-4-2 as late, but will likely have to shift into more of a 4-5-1. Stephen Sessegnon will start up front, but he could be joined by summer signing Connor Wickham up front if he passes fit and if Steve Bruce chooses to start two forwards. Sessegnon does not normally play a central striker role. Ji Dong-won could start up front as well. Sunderland are still struggling to cope with the loss of Asamoah Gyan up front, after the Ghanaian was sent on a season long loan to Al Ain in the United Arab Emirates. The formational change means that ex-Gunner Sebastien Larsson will play a wider position in the midfield than normal. The Swede made three first team appearances for Arsenal between 2004 and 2007. Sunderland have strengthened their defense corps with the signings of Wes Brown and John O'Shea from Manchester United, but will be without the services of Phil Bardsley and Titus Bramble, both of whom are suspended, for very different reasons. Bardsley serves the fourth of a four match ban for a violent conduct charge when Sunderland played Chelsea. The extra match in the ban is for it being his second red card of the year. Bramble is suspended indefinitely after he was arrested last month on a sexual assault charge and possession of a Class A drug. The greatest striker who ever lived. Photo: BBC. As you know, Arsenal's form this season has been pretty bad. Sunderland's form hasn't been great either. Something has to give! Or, you know, they could draw, or something. Alright, I guess I should go into a little more detail than that; detailed analysis of match trends is, of course, the point of Preview by Numbers. Arsenal's home form is not nearly as dreadful as their form overall, having won five of six games played at the Emirates this season (the loss to Liverpool being the blemish.) Last year, four teams came out of the Emirates with all three points (West Brom in September, Newcastle and Spurs in November, and Aston Villa in May.) Arsenal have won four straight at home and went 18 unbeaten there between the losses to Spurs and Villa last year. But, in that 18 match unbeaten streak was last year's 0-0 draw with Sunderland. As for the Black Cats, they have won once in seven fixtures this year (a 4-0 at home over Stoke) and have drawn three more, for a total of six points. In terms of their travels this year, they picked up a solid road point at Anfield on opening day and have also drawn away to Swansea and lost at Norwich. In Sunderland's last outing, West Brom jumped out to an early 2-0 lead at the Hawthorns, but the Black Cats clawed back (pun!) to draw 2-2. Nicklas Bendtner had Sunderland's first of the day, his first in red and white stripes. The flag that cost Arsenal three points. I think it was this one... GET HIM! Last season, both sides split their two matches evenly, with two fairly similar draws. This fixture last year was played in early March, one weekend following Arsenal's Carling Cup Final collapse. A strong result was needed to rebound from the calamity that had occurred at Wembley. Instead, we got a brutally low scoring affair, with nearly no offensive chances whatsoever. Arsenal could have had all three points, when Andrei Arshavin appeared to have an 87th minute winner that was then incorrectly flagged offside. Marouane Chamakh had earlier put a header onto the crossbar, which also could have been the winner. Instead, Arsenal and Sunderland settled for 0-0. The first fixture between the two sides came at the Stadium of Light in September and was the second time Arsenal dropped points last season. Cesc Fabregas put Arsenal on top with a freak goal in the 13th minute, when he blocked an Anton Ferdinand clearance. The ball sailed over the keeper's head and into the net. For all the luck of that goal, Fabregas injured himself in the process and he was replaced by Tomas Rosicky, an important development, as the Czech midfielder later blasted a penalty over the bar. This came after Phil Dowd sent off Alex Song for a second yellow around the hour mark. Then, five minutes into added time, Darren Bent equalized from a goal line scramble, and Sunderland earned a 1-1 draw, teaching us all to never start celebratory chants when the lead isn't comfortable. A year prior, both sides picked up three points from the two meetings, with Darren Bent scoring the winner at the Stadium of Light in a 1-0 Black Cats win in November of 2009 and Nicklas Bendtner scoring the winner at the Emirates before a Fabregas injury time penalty gave Arsenal a 2-0 win in February of 2010. 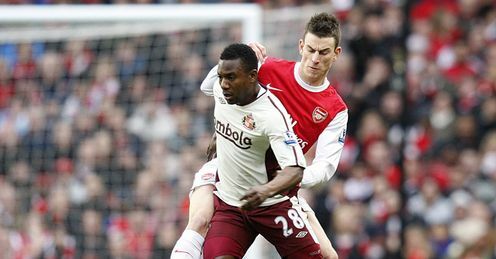 That was Arsenal's only win against Sunderland in now their last six meetings, with four of those matches being drawn. 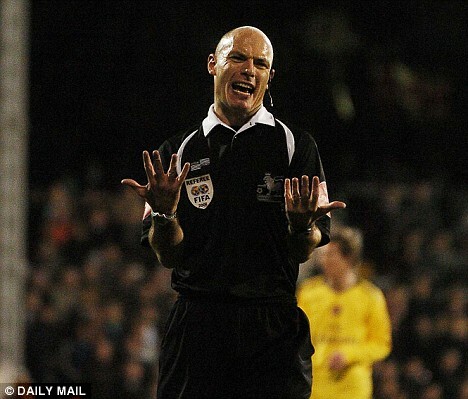 The referee for this match is South Yorkshire-based Howard Webb. As terrified as that made me at first, Arsenal is, in fact, unbeaten in eight straight matches not played at Old Trafford with Howard Webb in the middle. Of course, the last two times Arsenal have seen Webb, it's been in Manchester, and they were losses by 1-0 and 8-2 scorelines. Before that, the only other match Webb worked involving the Gunners last year was a 2-1 win at Everton. The year prior, Arsenal got two wins over Liverpool and a draw at Birmingham with Webb in the middle, and the year before that, it was two draws with Liverpool and home wins over West Bromwich Albion and Manchester United. Arsenal's form with Webb as referee, therefore, is W-W-D-D-W-W-D-W-L-L.
As for his matches involving Sunderland, Webb has taken charge of the Black Cats' 1-0 derby loss at home to Newcastle, in which defender Phil Bardsley was sent off for a second yellow in the 89th minute. He worked four Sunderland matches last year, two losses and two draws. Sunderland crashed out of the Carling Cup with Webb in charge, 2-1 vs. West Ham. After 1-1 draws with Spurs and Newcastle, Webb also worked Sunderland's 5-0 loss at Manchester City. Sunderland's last win with Webb in charge was a 2-1 win over soon-to-be relegated Burnley in April of 2010. He's also been a police sergeant. Also, here's a tabloid article that claims his wife says he can't control his own children. 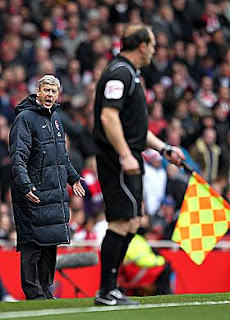 I now imagine he uses red cards to punish them, with little effect. 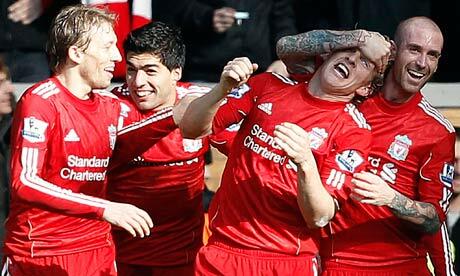 Dirk Kuyt's hat trick beat United at Anfield last year. Then, Raul Meireles ripped his head off, for some reason. The weekend kicks off with a huge match as Liverpool hosts Manchester United at Anfield. Last year, Liverpool won that fixture (which was also played the weekend Arsenal played Sunderland at the Emirates) thanks to a Dirk Kuyt hat trick. Chelsea hosts Everton in today's late game, leaving five matches in the standard 3:00 p.m. / 10:00 a.m. Eastern time slot. Manchester City hosts Aston Villa in a match that was supposed to be played in the early Sunday slot which is now occupied by Arsenal's match. The move occurred because City has to play Tuesday in the Champions League. Elsewhere, Norwich hosts Swansea in a battle of newly promoted sides (how long can you say that... it is October...), QPR hosts Blackburn, Stoke hosts Fulham, and Wigan hosts Bolton. That all sounds very enthralling, doesn't it? Tomorrow starts with a West Midlands derby, as West Brom hosts Wolves at the Hawthorns. After Arsenal's match, the weekend closes with Newcastle hosting Tottenham. With a match-up like that, at least it's a little easier to root for Newcastle now that Barton is gone, isn't it?